I know—I’ve had rather a high proportion of sweets-related posts in the last few months. But I can’t let Christmas go by without writing something about mince pies, which are for my family the equivalent of chestnuts roasting on an open fire (or something like that). 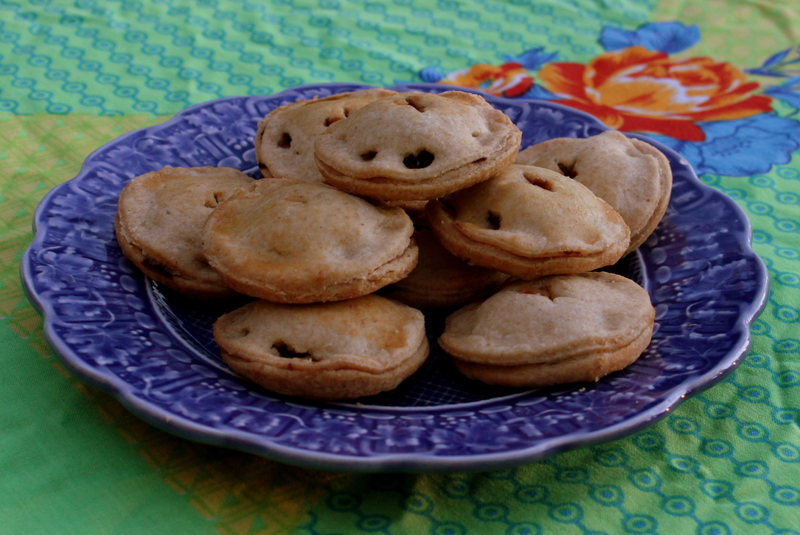 Mince pies aren’t all that common in the US. They’re the sort of thing that as a child you imagine Christmas couldn’t exist without, until you encounter enough raised eyebrows at their mention to set you straight. You could think of them as a dessert, but their ideal counterpart is tea—steaming PG Tips served in china teacups with gold rims. In my family the mince pie-making starts early in December, and it’s all about the assembly: cutting the bottoms and tops with a tall beer glass, buttering my grandmother’s special indented pans, slicing little crosses on the tops for the steam to escape. To this end we’ve always kept it simple with store-bought pastry and store-bought mincemeat, though the jar is liberally doctored with rum as soon as it’s opened, of course. When December arrived several weeks ago, though, I had no pastry in the freezer, no bottle of mincemeat mysteriously still fresh after a year in the back of the fridge. I’d never considered making the filling—a rich, jammy mix of fruit of spices—myself, but desperation drove me to eye the raisins and apples in our pantry and the ancient bottle of vermouth perched above the cottage stove. The following recipe comes after several tries, but I can safely say I’m a homemade mincemeat convert. Playing with it—trying different fruits, nuts, and liquors—has been lots of fun, and there’s little else I can imagine that will make your kitchen smell quite so delicious. 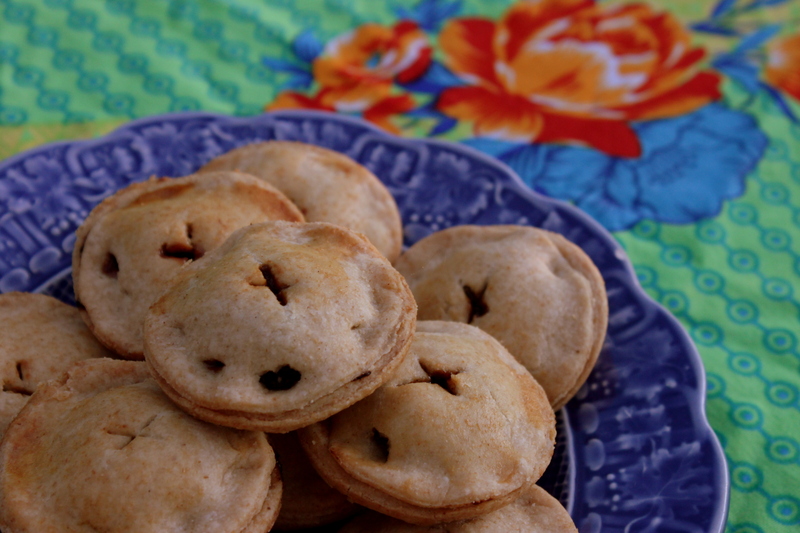 Below is my own recipe for the mincemeat filling, and I also made the pastry from scratch using this recipe from the blog I turn to for all things baking, Smitten Kitchen. To make the filling, melt the butter over medium heat in a small saucepan and add in the chopped apples. Sprinkle with liberal pinches of cinnamon and cloves, then add the brown sugar and stir until the apple pieces are coated with butter, sugar and spice. Add the orange zest, juice, and rum to taste, then add in your assorted dried fruit. Pour a bit of boiling water until the fruit is just covered, then turn the heat to low and simmer, covered, until everything is soft, thick and gooey. Meanwhile either make or defrost your pastry and roll it out until it’s fairly thin. Use a glass to cut your circles, and place the bottoms in a muffin pan. Scoop a small spoonful of the mincemeat into each bottom and run a finger dipped in water around the circumference of the pastry–this will help the top adhere to the bottom. Press the tops on using your fingertips to pinch the edges together, then finish by cutting small crosses on your pies and brushing them with egg. Bake at 350 degrees for 15-20 minutes, or until the pies are golden brown.